Wow! That is all I can say is wow! 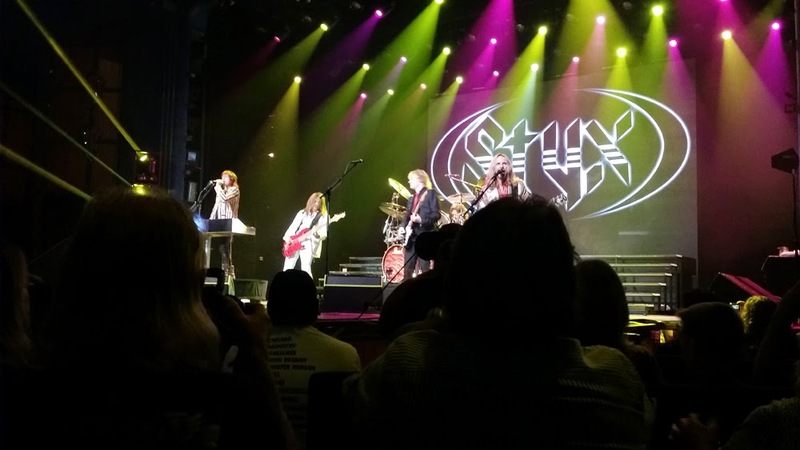 On October 9 I got to see one of the world's greatest rock bands Styx play on the Carnival Breeze and it was amazing! This was not my first time seeing Styx live. I have seen them two other times once in an arena and once outdoors and the experience in the Carnival Breeze's main theater was by far the best I have seen. I would have to say that the experience of sitting in a theater with great acoustics and with about 1500 people really made the experience awesome. No matter where you sat you would feel like you were having a private concert. 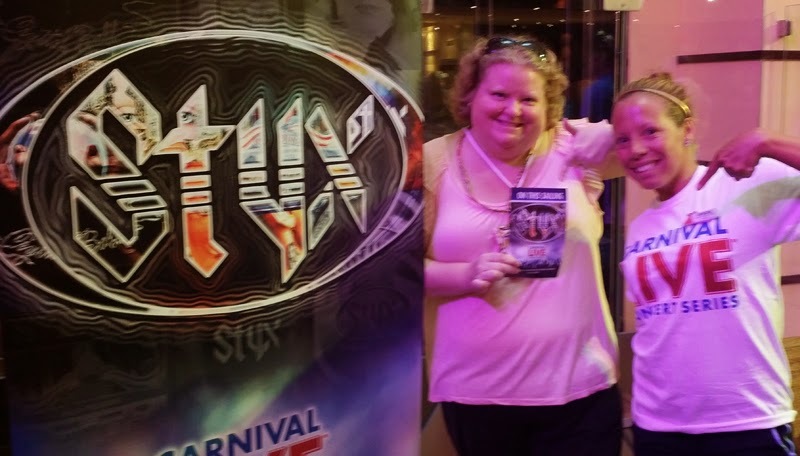 Carnival started this year with the carnival live concert series on many of their ships with artists including Lady Antebellum, Trace Adkins, Chicago, and of course Styx! Thus far Carnival Live has been gaining interest rapidly from people looking for a vacation where they can see their favorite band. Some cruise ships already have sold out dates for Lady Antebellum and Trace Adkins. 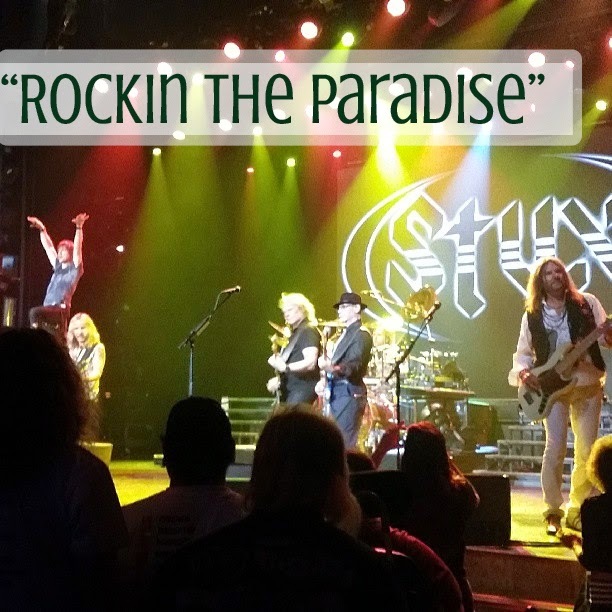 Besides the growing interest from vacationers Carnival reps say that bands are now coming to them and inquiring how they can get a tour date after hearing how well the concerts are going. While we as concertgoers love seeing our favorite artists perform in a small venue the artists also love to play to a more intimate crowd and so it is a win-win for the performs and for the fans. Prices for the concerts range from $20- $65 depending on concert for general admission. If you are looking for the VIP experience which includes seating in the first couple rows of the ship's theater, and a meet and greet with the performers prior to the show where you also get to take a picture the performers starting at $125-$250! How cool is that? 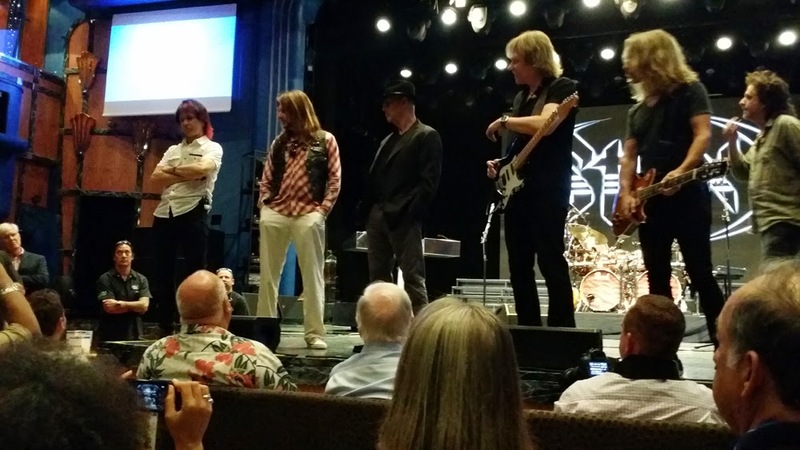 Click here to see the concert dates and cruises available thru June 15, 2015. If you are looking for a great vacation this is definitely it! You can play all day either enjoying the sea days or the ports and then one night of the cruise you can live it up with your favorite band! Best part no need to drive home because you are home! You and your friends can continue the party at one of the many bars or clubs on the ship. For those of you who have never taken a cruise before this is the perfect first time. There are some 4 and 5 day cruises to choose from if you do not want to choose a 6 or 7 day. I will have more articles coming up on my experience on the Carnival Breeze and I will be doing an article on cruising myths vs reality for all of you who have never cruised but hear all these things about cruising that are just not true or maybe you have misconceptions yourself. I want to thank Carnival for bringing me on the beautiful Carnival Breeze and allowing me to see one of my favorite bands!